1.Mix above ingredients. Press into top and sides of 9 x 13' greased pan. Reserve 1/2 cup for top. 1.Melt marshmallows and milk over low heat. Beat cream cheese; add marshmallow mixture. Cool. Fold in Cool Whip. 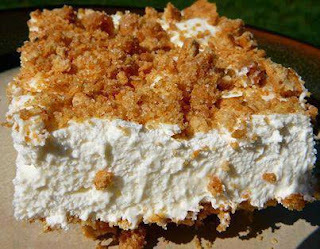 Spread into crust and sprinkle with remaining graham cracker crust. Refrigerate until set.